In the 1880s and ‘90s the Upper West Side was developing at a blinding rate. Comfortable homes for middle and upper-middle class families filled the side streets while the avenues became lined with mansions designed in the latest styles: Flemish Revival, Romanesque and Queen Anne. 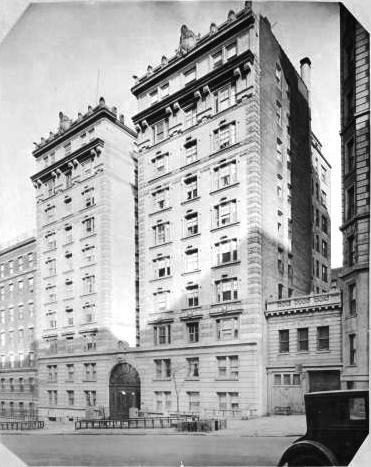 With the mansions came the need for private carriage houses and a row of two-story stables was erected along West 79th Street to serve the home owners of West End Avenue. Among them was No. 305 – a modest but attractive structure of gray-beige brick with limestone trim. A plain limestone cornice supported by brick pilasters with stone capitals separated the two stories. By The recessing every fifth course of brick of the second floor the architect accomplished the feel of rusticated stone. Here he added eye-catching splayed limestone lintels above the three window openings. An unpretentious pressed metal cornice was topped by a handsome stone balustrade. As more and more residents poured into the Upper West side, schools, hospitals and churches followed. Shearith Israel built its impressive synagogue on 70th Street and Central Park West and down the block from No. 305 West 79th the elaborate Dutch Reformed Collegiate Church was erected. Times changed for the little carriage house and the neighborhood as a whole. By the turn of the century many of the grand houses along the avenues were being razed; replaced by immense apartment buildings. In 1907 the carriage house was no longer a private stable. The Auto Operating Company was doing business here as the era of the horse gave way to that of the automobile. Before the outbreak of World War I every structure on the block had been demolished—every one except for No. 305. At the corner of West End Avenue the hulking red brick and limestone New Century apartment building was constructed in 1910 and at No. 307 West 79th Street rose the Imperial Court. Squashed in between remained the little brick former carriage house. A Mr. Hargraves fell on hard times in 1914. He parked his impressive seven-passenger Peerless automobile which he had bought in 1912 in No. 305. The car boasted “every modern equipment” and was a hybrid of the landaulet and touring bodies. Hargraves had paid $6,200 for the car—over $100,000 today. The building was used by the Imperial Apartment for years. A laundry was installed on the upper floor while tenants’ automobiles were garaged below. 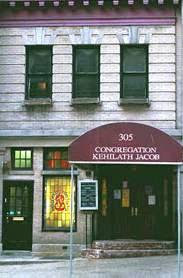 Then along came Congregation Kehilath Jacob. The small group acquired No. 305 in the 1940s and renovated it as a synagogue. Unlike some of the other, grander temples, the congregation expressed its joy and devotion through dance and song as well as more traditional rituals. In the meantime Rabbi Naphtali Carlebach was among the leading rabbis in Berlin and, later, Baden, Austria. With the oppression of the rising Nazi Party, the rabbi brought his family to the safety of the United States. In 1950 Rabbi Carlebach assumed leadership of the congregation. At the time of his death in 1967, his son Rabbi Shlomo Carlebach took over the guidance of the synagogue and in the 1980s his twin brother, Rabbi Eli Chaim, assumed an equal position. Rabbi Schlomo Carlebach was an accomplished songwriter, prompting The New York Times to call him “the foremost songwriter in contemporary Judaism.” His “Am Yisrael Chai” became a rallying cry for Jews trapped in the Soviet Union. Indeed the little brick holdout stuffed between the massive apartment buildings is endearing enough—that there is a synagogue inside makes it one of New York’s hidden wonders. The place seems to be historical. I might visit this area someday.